"The Irish gave the bagpipes to the Scots as a joke, but the Scots haven't seen the joke yet." Let heir be shraichs of deadlie clarions." 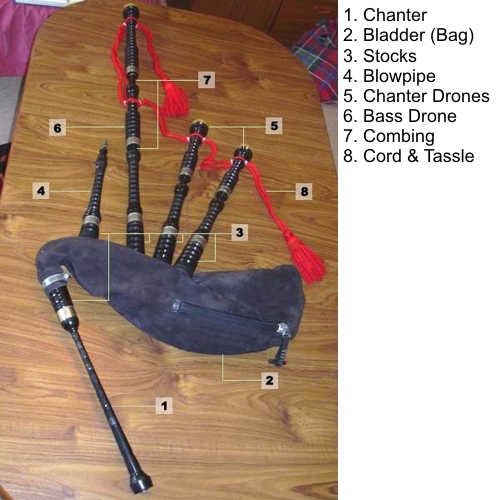 The pìob mór, or Great Highland Bagpipe, was originally associated with both hereditary piping families and professional pipers to various clan chiefs; later, pipes were adopted for use in other venues, including military marching. (It was the British military that spread the Great Highland Bagpipe throughout the Empire.) 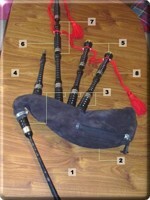 Piping clans included the MacArthurs, MacDonalds, McKays and, especially, the MacCrimmons, who were hereditary pipers to the Clan MacLeod. The Piobaireachd, also known as ceol mor, or "great music," is Scotland's only native genre of classical music, and is performed on the Great Highland Bagpipe. Gaelic for "piping," this type of composition is the nation's finest contribution to the culture of European music. Many ethnomusicologists believe that the form originated in the Hebrides out of Irish harp music, although piobaireachd is the only style in which the harmonics and tone of the bagpipe can be completely realized. The composition of this music is highly sophisticated, which suggests that the musical styling developed over a long period of time, reaching its apex in the golden age of the seventeenth and eighteenth centuries. Symphonic poetry written in song meter, piobaireachd was passed through the centuries in the oral tradition. 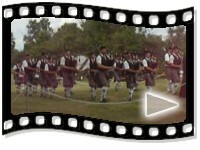 The Great Highland Bagpipe features prominently in many civilian and military bands across the world. Windsor has produced many outstanding pipe bands, including the Windsor Police Pipe Band and the Scottish Society of Windsor Pipe Band.